Miss DuBois is sending her annual contribution towards a scholarship. 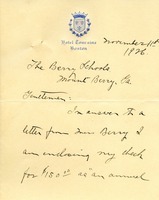 Miss Coomes writes to Martha Berry to inform her of an enclosed check meant as a payment on her annual scholarship. Trowbridge writes to give instructions about an annual scholarship as she is worried that Mrs. Hammond may have misplaced them. 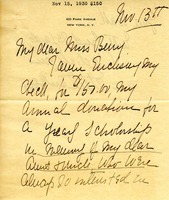 She is giving the scholarship in memory of her nephew who died in the war and would like it to go to some especially worthy boy. She also wants to know the recipient's name and be able to follow his career. 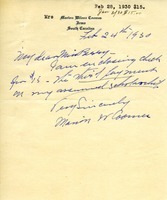 This doccument contains the donation to an annual scholarship Mrs. Henry B McCormmick made, and includes the add to which she responds. 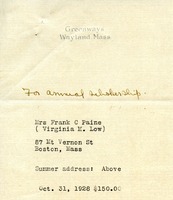 This is a donation from Mrs. Frank C. Paine of 150$.